Wine and cheese in Mexico – who knew?! 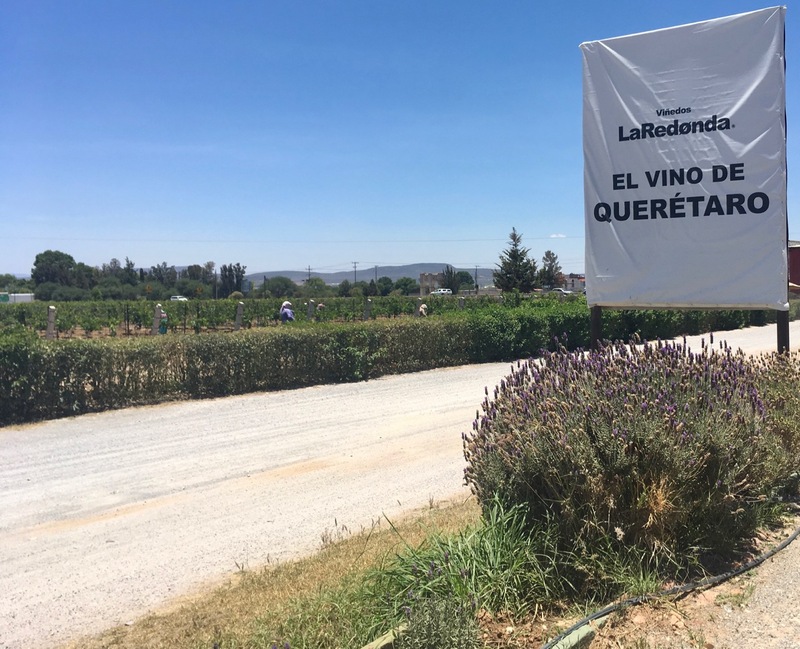 We are cheeseheads, after all, and were thrilled to find there is a wine and cheese route just a few hours away from Mexico City. We checked it out with our friends Josette and Scott during Tequisquiapan’s wine and cheese festival. Matt was the tour director and Scott was our accommodating designated driver (he’s a beer guy) for the weekend. We started out at a reasonable hour on Saturday with our only goal to arrive at the Freixinet winery by 2 pm because we had tickets for its paella festival and we were told the paella could run out. First stop was the Neole cheese shop for a tour and tasting. We were joined by a tour group and headed behind the cheese shop for the simple tour that doubled as our daily Spanish lesson. We checked out the cheese making area, had the process described to us and then enjoyed our first cheese tasting of the trip. We would learn at our second cheese tasting that orange slices are to cleanse the palate, sweet is to temper the taste of the cheese and salty is to intensify the cheese’s taste. I used this guide as my excuse to eat the sweet pieces of “ate de membrillo” or quince jelly every time I tried a bit of blu or smoked cheese. Even though we were full from breakfast and our subsequent cheese tasting, next stop was another cheese shop. Except we couldn’t find it and even Matt had to concede that despite its presence on his GPS, it didn’t really exist. No worries, it was time for some wine instead and we stopped at Viñedos Los Rosales. The grounds were beautiful, the servers were friendly and patiently described the wines we could taste and… the wines were terrible. So terrible that while we only had tiny 1-ounce pours, we still furtively dumped them out on the ground instead of finishing them. Driver Scott could rest easy that he hadn’t missed anything as he had taken a pass on the tasting, and we could all be confident that our $2 wine tasting fee was worth knowing never to drink Los Rosales wine again. To get the bad taste out of our mouths, we quickly turned into Viñedos La Redonda for our second tasting. 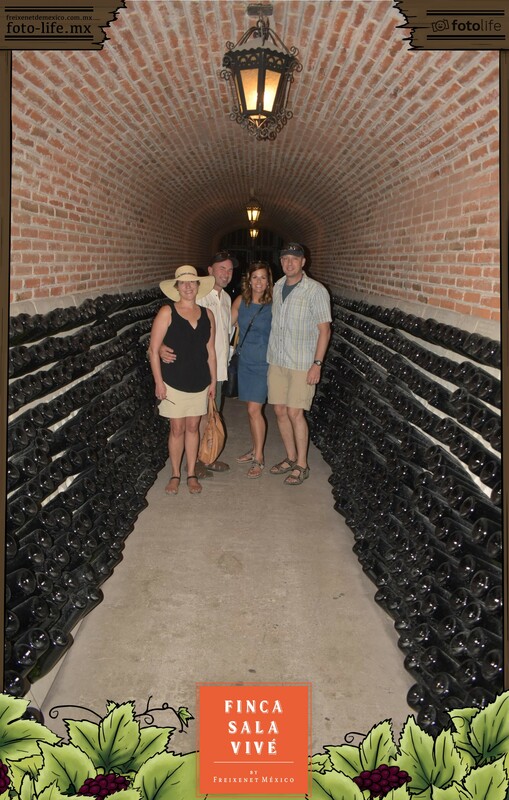 We opted to skip the tour (as we had done at Los Rosales) and headed to the tasting room at the front of the property. While the attendants couldn’t have been less interested in explaining the wine to us, the view was great and the wines were good. After enjoying our wine and the view, it was off to the paella festival at Finca Sale Vivé by Freixenet. What a great time! After the usual ex-pat confusion (we had advanced tickets but had to stand in a ticket line anyhow), we got our glasses and our complimentary wine and were off to enjoy the fest. We started with a review of the entries into the paella competition. The entrants were gastronomy schools and the offerings looked amazing so we purchased from the friendliest group who told us their special ingredient was mezcal. Next up was a tour of the winery including the underground wine cave, which the winery claims is the only one in Latin America. It was a refreshing break from the sun and nice because we could wander about at our own pace. Back outside we checked out the hot air ballon, refilled our glasses and continue our wandering. The entrepreneurs who were supposed to be signing people up for rides the next morning were running a little side business taking pictures of people inside the balloon. We admired the effort and stepped inside. The festival crowd was laid back and family-friendly (despite the occasional passed out over indulger) and there were several seating areas with music. We headed through the vineyards, found a seat at the outdoor tent and enjoyed a mariachi band and then a band playing tunes like Stand by Me. I don’t think I have ever been in a vineyard surround by cacti before. Up, Up and Away. Or Inside, Anyhow. Wine and Paella Lovers, Unite! We left the festival and headed back to enjoy the pool at our lovely hotel. Afterwards, we returned to the main square of Tequisquiapan and went to La Vaca Feliz (The Happy Cow) cheese shop. It was crowded and we were a bit overwhelmed when the gentleman behind the counter took an interest in us and began describing all of the cheeses and giving us samples. We must have tasted 15 kinds of cheese! The man (if we got his name, I forgot it) was actually an optometrist who loved cheese and was eager to practice his English with us. We bought couple of kinds but assured him we would be back on Monday before we left town. We did, in fact, return, and while we were disappointed that many of the cheeses we intended to buy had sold out over the weekend, we found plenty of other kinds to buy instead. And while our new friend wasn’t working, the woman who assisted us also generously gave us about another dozen samples. Day 2 was as exciting and wine-filled as Day 1 and once again began with cheese. We went to Bocanegra – the companion cheese shop to Neole where they have a cheese cave. It looks like a winery – a gorgeous building with cool art in a beautiful setting. Wisconsin cheesemakers should take note. 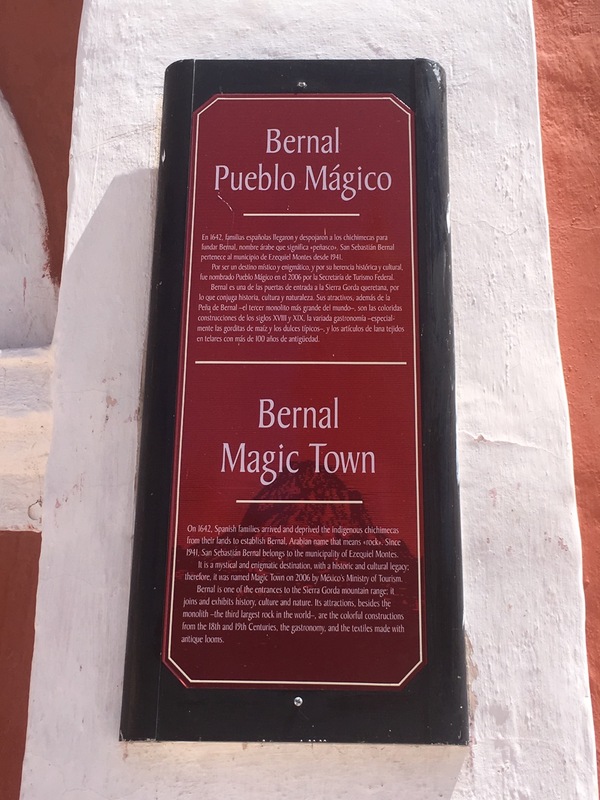 It wasn’t all wine and cheese (and the occasional beer) – we were headed to the Pueblo Mágico (Magical Town) of Bernal to see the Rock of Bernal. 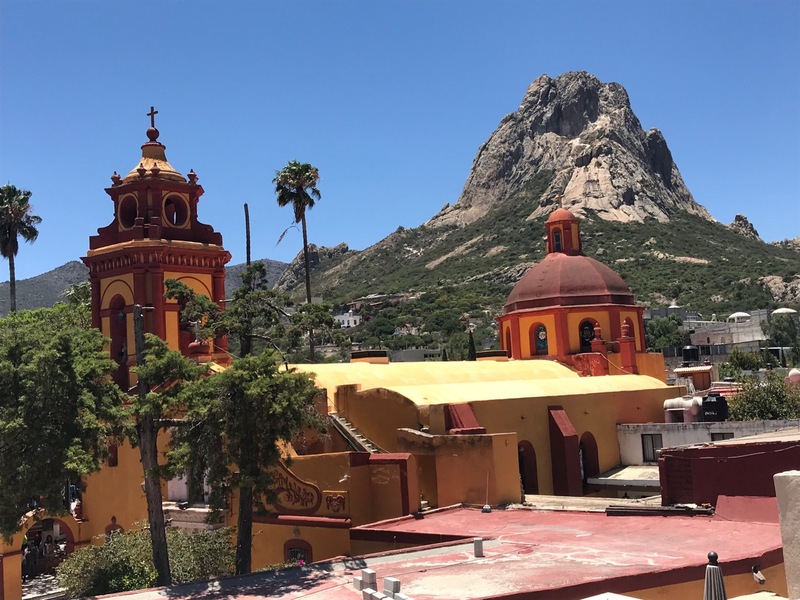 Mexico designates certain towns as “Magical Towns” to promote tourism, protect traditions, provide jobs and highlight the towns’ cultural or natural significance. 83 towns or villages throughout Mexico have the designation, and Tequisquiapan is also one. 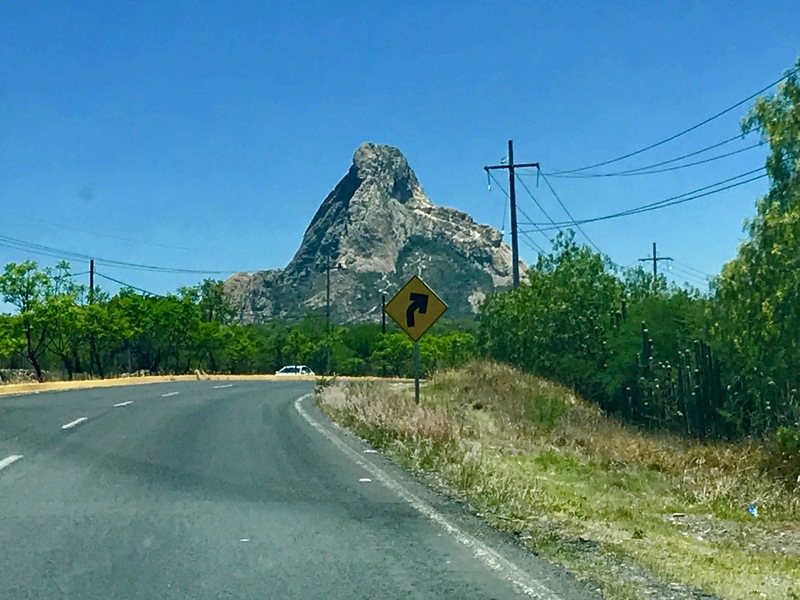 I was game to explore another Pueblo Mágico, but I was confused by Bernal – a big rock was all it took? My first glimpse of the rock did not impress me. I did some quick internet research and learned it was the 3rd highest monolith on the planet. What the heck is a monolith? The Merriam-Webster definition, “a single great stone often in the form of an obelisk or column” didn’t do much to enlighten me. We got to Bernal, parked the car and wandered around the cute town. The rock grew on me – the town was in its shadow and it was cool to see it looming above. We wandered in and out of shops on our way to the main square. We were admiring the church when we noticed a bunch of kids hurrying to stand before the door. They were eagerly awaiting something, which I didn’t think it was for mass to start, when the door opened and a guy started throwing coins to the kids. They scrambled for their share and then resumed the wait. What the heck? We saw a family come out with a newly baptized baby and Scott surmised that the tradition must be to throw coins to kids after your child is baptized. Sure enough, we entered the church and saw the set up for another baptism. Later research confirmed that this practice is called a “bolo” and the baby’s godfather throws the coins to ensure a prosperous life for his godchild. We went to a restaurant called El Negrito, which is a little disconcerting to an American as it translates to pickaninny. (Peru had a restaurant in the airport called La Negrita.) The terrace view was lovely and we enjoyed our lunch before heading back to Tequis for a cool down in the pool before going to the Wine and Cheese Festival. While I think Matt, Josette and Scott would have been happy to stay at the pool and skip the wine and cheese festival, they humored me and we headed to the park, paid our entry fees, bought our glasses and started tasting. There was a pavilion set up with several rows of wine and cheese stands and a stage in the front of the grounds with several benches. I think there also was a food area, but we never made it there as we arrived with only two hours left of the festival and were focused on the tastings. While it was the last day of the festival and you could tell some of the vendors were ready to pack up, most were very friendly and happy to explain their wares to us. Like the paella fest, the vibe was relaxed. We left with several bottles of wine and cheese, so it was a worthwhile addition to our busy day. The next morning after our final stop for cheese at La Vaca Feliz, we left Tequis with 9 bottles of wine and about the same number of cheeses. My only disappointment – no cheddar! * In addition to Matt, as usual, photo credit for this post goes to Josette and Scott. Thanks, friends! I love visiting archeological sites. I drive Matt crazy because I want to read and look at everything, but I find it fascinating to see the remnants of ancient cultures. Equally fascinating to me is that we often know little about such cultures or sites but that doesn’t stop the experts from positing all sorts of theories that they later retract. It’s like being a meteorologist – no one seems to care whether you are wrong. 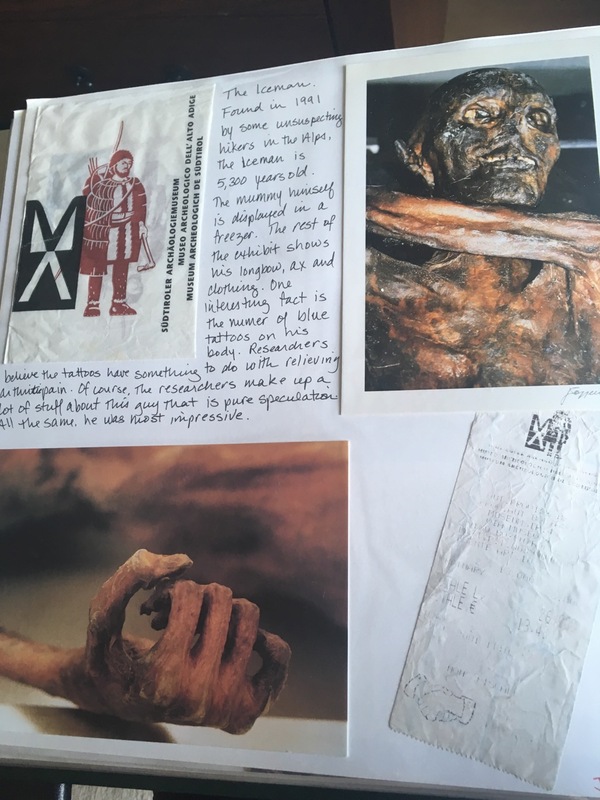 In 2001, Matt and I visited the Iceman of Bolzano and I was cracking up over the tale the experts had developed about the noble origins of ol’ Ötzi and told Matt that it was equally probable that Ötzi was a criminal and killed a nobleman for the fancy breeches in which he was found. Guess what became a prevailing theory a few years later? I’m still convinced that some researcher overheard me and stole my completely made-up theory to add to the mix. But I digress. 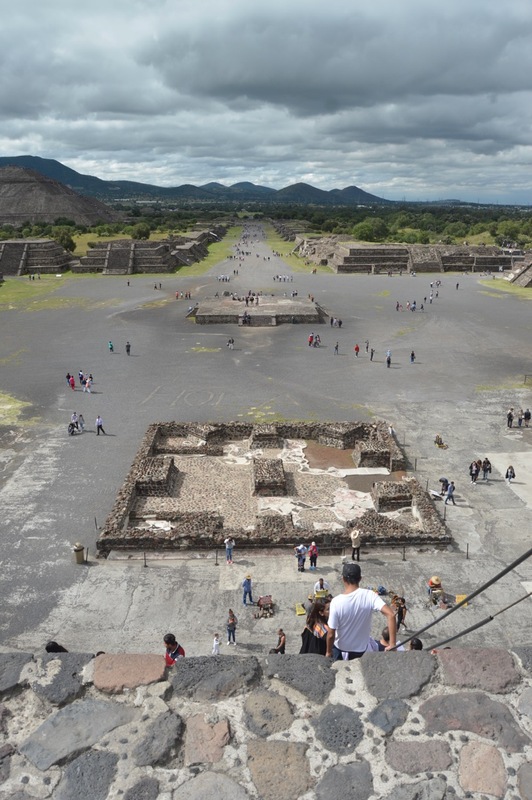 Teotihuacan is ripe for stories: an archeological site about 40 minutes north of Mexico City, no one knows who built and inhabited the city. The name is a Nahuatl one given to it by the Aztecs long after the city was abandoned; similarly, the names of the buildings were given by the Aztecs. The major buildings were constructed between 100 BC and 250 AD and it is believed that by the 4th century somewhere between 85,000-150,000 people may have lived there in an area that covered 8 square miles. (Note the huge variation in the population figures – The official site says up to 85,000 inhabitants while others claim up to 150,000 people. Ahh, to be an anthropologist!) If this is true, it would have been the largest city in the Western Hemisphere at that time, assuming there aren’t some other hidden cities we haven’t found yet or that were completely demolished. By 900 AD, the site was mainly deserted and many of the structures were burned. Differing theories attribute the demise to a class uprising or a war with outsiders. The model sets out the town and includes buildings that haven’t yet been excavated. Regardless, the accessible parts are a marvel and we had great fun on our first visit wandering about with Beth and Chris. 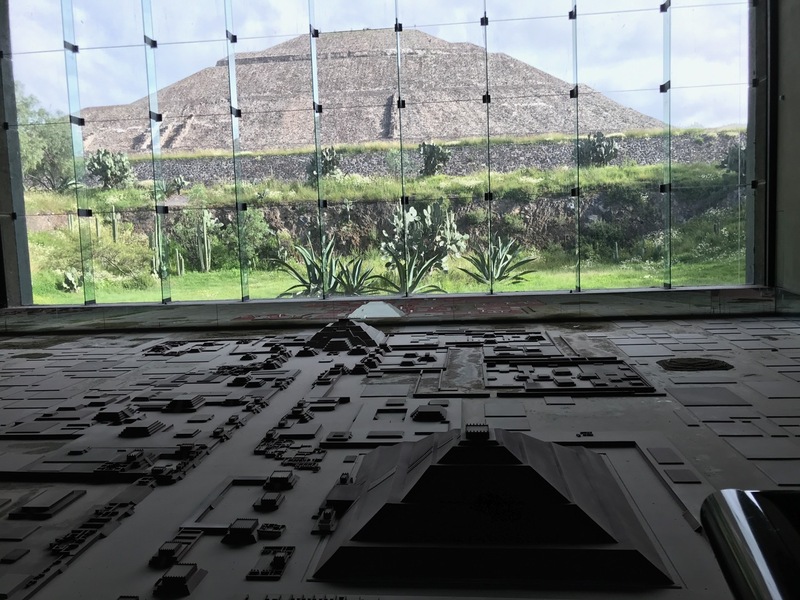 After a quick browse through the museum, we started at the Sun Pyramid. I had read horror stories about climbing it and while it was steep, it only took about 10-15 minutes to make it the 213 feet to the top. We appreciated the overcast day as we huffed it up the stairs. We meandered down the Avenue of the Dead to the Moon Temple. Along the way we checked out the Puma painting and the various buildings. We were short on time so we skipped the Citadel with the Temple of the Feathered Serpent (Templo de Quetzalcóatl), but Matt and I had seen a replica at the National Museum of Anthropology. I persuaded everyone that we needed to climb up the shorter Moon Temple, so up we went. The views were wonderful and we weren’t even allowed to climb the entire 141 feet, so it was a breeze compared to the Sun Temple. Our last stop was to the Palace of the Quetzalpapaloti and Patio of the Jaguars where we saw more frescos and some carved columns. Matt enjoyed Teotihaucan, but wasn’t eager to return (because I would make him climb everything again). But when his school invited us to enjoy the nocturnal light show, even he was in. It was a spectacular night. They severely limit the number of tickets and keep everyone on a schedule. First you have a guided tour of the site and walk down the Avenue of the Dead. All of the buildings are lit up with changing colors. While you can’t climb any of the structures, it was an equally impressive experience given the lights. It was easy to imagine the area flooded with candlelight for some ancient ritual. After about an hour, we were all ushered to sit on the stairs to watch a light show projected on the Sun Pyramid. It told the story of Mexico and had some beautiful images and sounds. Unfortunately, not much could be captured on film. 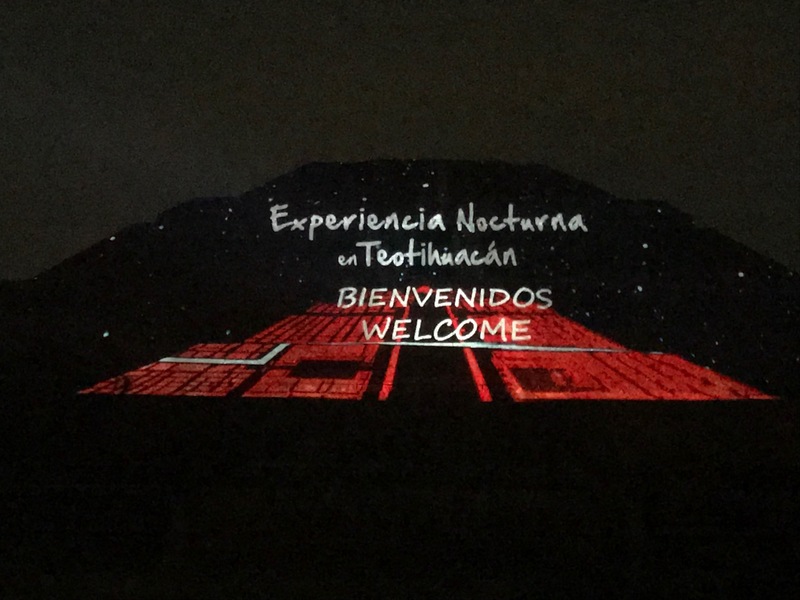 Teotihaucan is an excellent day – or night – trip from Mexico City. The magic of nature! It was fascinating how the elements and time combined to plop down these rock playgrounds at random intervals. We had a blast exploring although the rest of the group was definitely more adventuresome than we were. Climbing is not among my skills. Go Ask Alice was my mental soundtrack often throughout this surreal trip. This view reminded me of a sand art picture someone had when I was a kid. 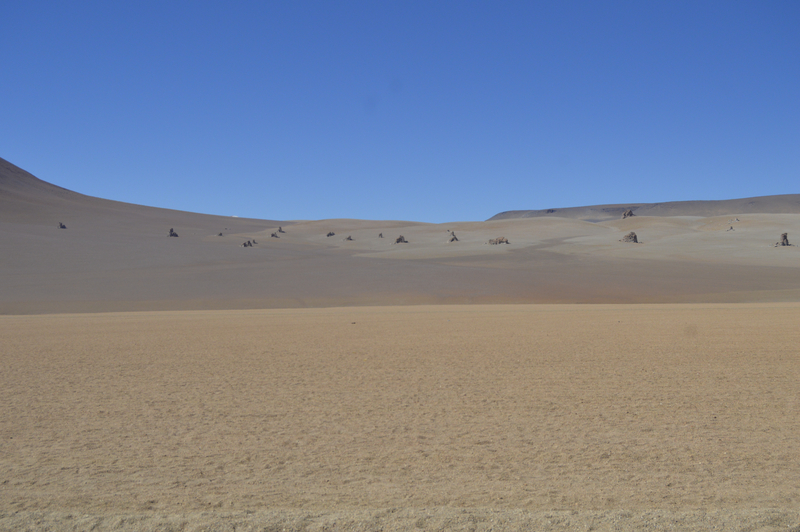 Despite the desolate landscape, we saw some animals on the trip in addition to the flamingos and viscacha. One challenge of the long drives is the lack of bathrooms or shelter for a “natural” bathroom. We were all desperate on the second day, which wasn’t a big issue for the men but a hardship for us women. At one stop we found some scrubby bushes, but when I saw evidence of prior use, I managed to hold off until we hit a store about 2 minutes from our hotel. Not a moment too soon! We stayed in a salt hostel the second night. The tables, chairs, beds, and interior walls were all made of salt. It was still frigid, but the accommodations were slightly better – we had a private, windowless room – and the workers were friendly. In order to see the sunrise from Incahuasi Island, we were on the road shortly after 5 a.m. on the third and final day. Of course, there was no road; we were driving in the dark across the salt flats. It was disorienting: I felt as though we weren’t moving because the landscape never changed – the salt flat is over 4,000 square miles! I spent the entire day convinced we were on a frozen lake as opposed to a salt flat. I kept expecting to see some ice shanties and snowmobiles. The island was amazing. It was the top of a volcano back when the salt flat was covered by a sea. Now it is covered by cacti, but you can still see the coral and other fossils. We got there and hoofed it to the top to get perfect pictures of the sunrise. For some reason, I had a hard time getting to the top, possibly due to the altitude or because I am not a morning person, but I managed to get there in time to see the sunrise along with a crowd of tourists. I tend to find sunrises overrated (don’t get me started on the Grand Canyon sunrise trip!) but this one was spectacular. Tell Me It Doesn’t Look Like a Frozen Lake! After breakfast we zoomed across the ice salt to get to the “perfect” spot for our photo shoot. Due to the expanse, the horizon is messed up and the shots are surreal. We played around for a couple of hours. Beatriz and Jorge came well prepared – shots off the salt flat! After a fast stop at a salt hotel, which apparently was only open for the Dakar rally, and a small town for trinkets, we were on the outskirts of Uyuni at the Train Graveyard. This is always the part of every trip when Matt and I would call it a day, but the tour operators want to give you your money’s worth even if obviously not everyone welcomed tourists. 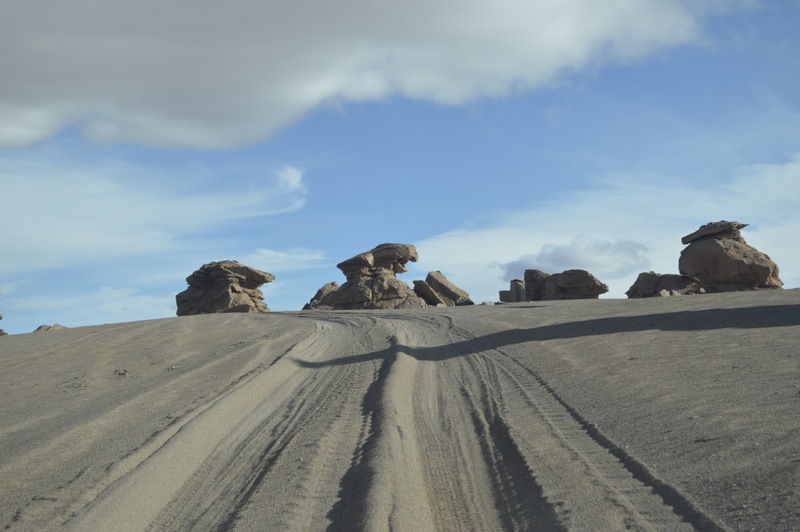 Uyuni was a desolate, depressing town. While there was plenty of space because it was surrounded by the salt flat, there was garbage dumped on just about every corner. I couldn’t imagine why anyone would live there if they had a choice. I asked our guide if he lived there and he spoke with pride as to how healthy it was there and how people never get sick because they have a good quality of life. I was stunned, but to each their own. We checked into one of the nicest salt hotels in town (at about $55 a night) and enjoyed the hot shower and comfy beds! 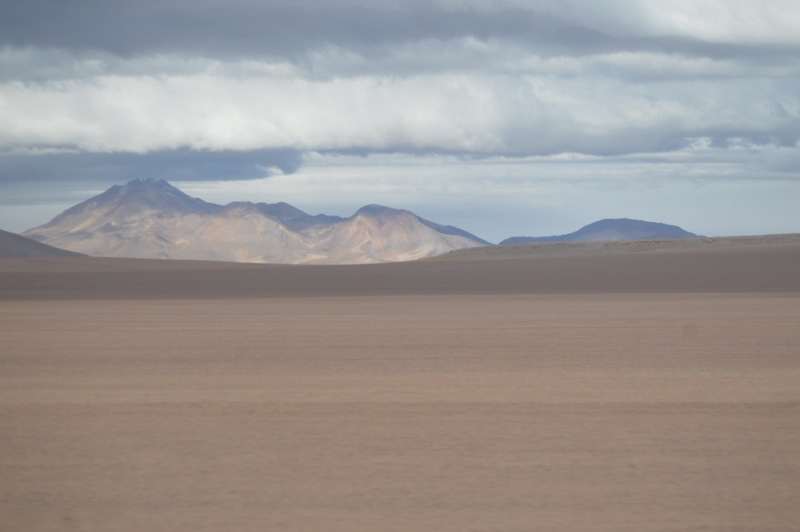 “What a long, strange trip it’s been” sums up the Uyuni salt flat tour perfectly! “We are 20 years too old for this trip,” I protested. 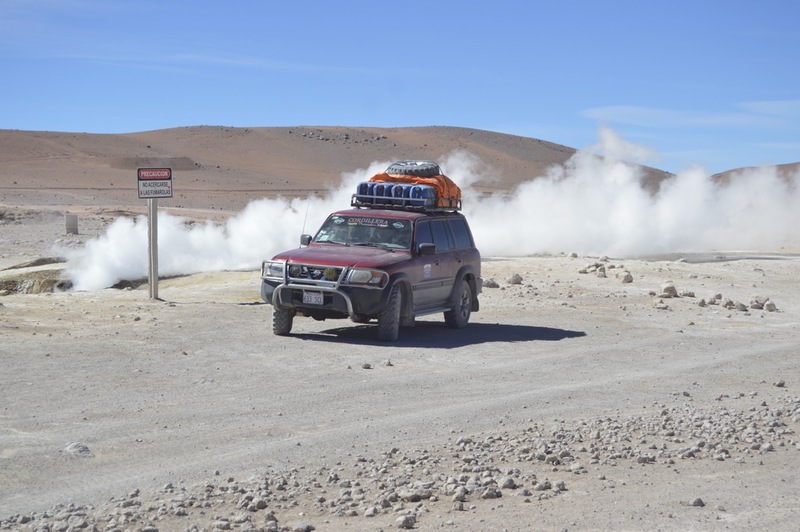 “This trip” was a 3-day, 2-night SUV trip through the high plains of Bolivia and ending in the Uyuni salt flat, the world’s largest. The reviews and tour operators were blunt – there is nothing luxurious about the trip. We would be bumping along basic roads, staying in hostels, and paying for cold showers. The basic accommodations weren’t my main issue – I’ve grown more accustomed to roughing it than I ever expected – road trips are not my thing. No matter how beautiful the scenery, my attention span is short. But Matt was set on going, and our friend Lisa enticed me with some fantastic photos and assurances that the scenery is different at every turn, so I ultimately acquiesced. 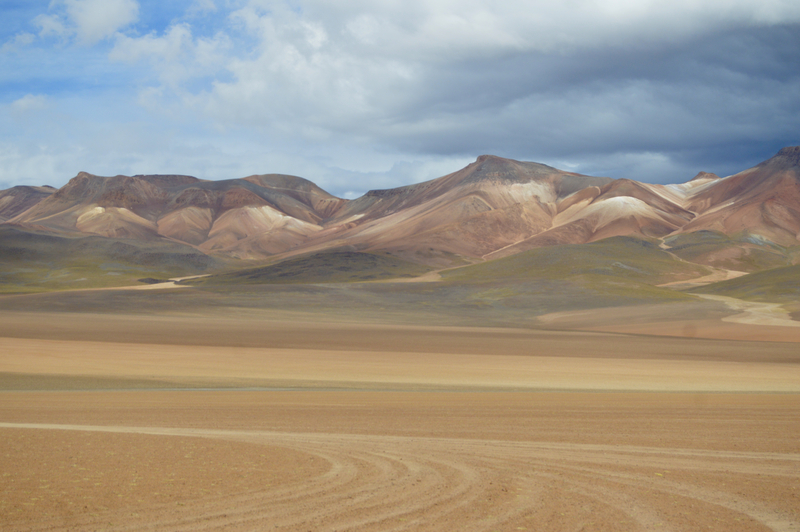 We were in San Pedro de Atacama, Chile, and would cross the Chile-Bolivia border at the onset of the trip. 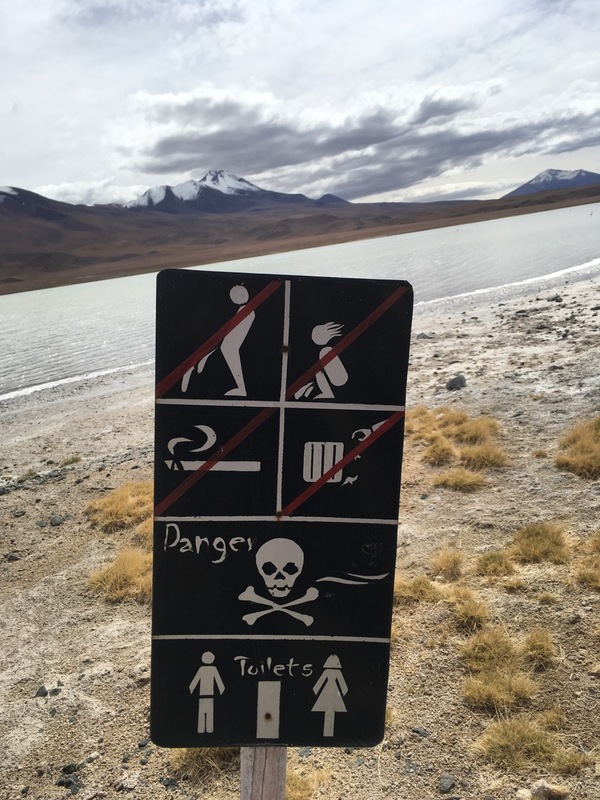 We didn’t have Bolivian visas, but the tour operator told us that all we needed were two headshots each, our yellow fever cards and passports in order to get the visas at the border. We had one one photo each, and he assured us that it would likely be fine. We were booked on day tours in San Pedro and when we tried to get new photos in the late afternoon the day before our Uyuni tour, we were out of luck: the store was open, but the woman who took the photos wasn’t working that day. Four years ago we would have freaked out at this news and railed about how inefficient it is to have only one worker who can take a picture anywhere in town, but we just shrugged and hoped for the best. On the day of the trip, a Chilean driver picked us up in a van early in the morning and drove us about 6 blocks to the Chilean immigration office where we joined the the long line of fellow travelers. After about an hour, and somehow with our group being corralled to be dead last, we had our exit stamps and were free to leave the country. Door to the Immigration Office – Look Carefully – I Closed Wolski’s! We set off through the desert to the border. 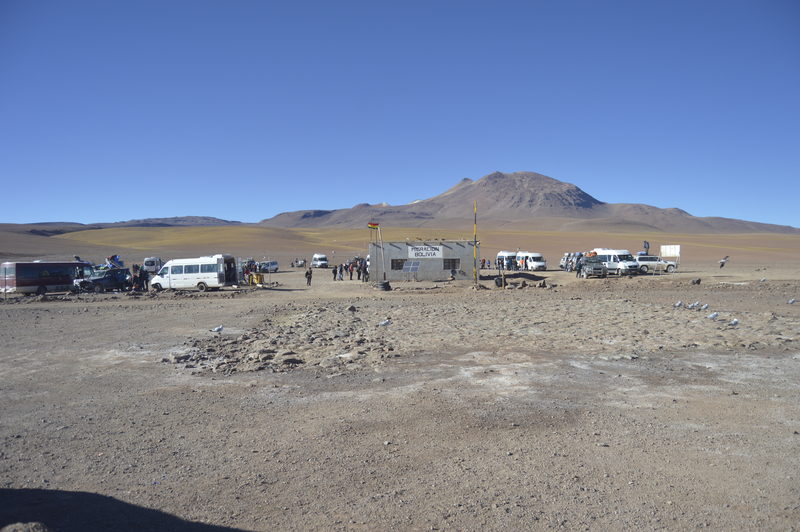 That is, first we hit the Chilean border and then after 10 minutes of no-man’s land, we hit Bolivia. Bolivia Was Waiting, but Would We Get In? We headed inside to immigration while our Chilean driver transerred our stuff to the SUV and our Bolivian driver. We were a little nervous about the one-photo issue when we got to the front of the immigration line. There were two men working: a policeman and the immigration official. The policeman took our documents and asked for our color copies. Ummm, what? We had passport copies somewhere in our luggage that was now strapped down on the SUV, but no copies of our yellow fever card. Matt let me do the talking and I played the stupid card – because we were. I apologized profusely, asked what we could do, and explained that no one told us we needed copies. The policeman feigned concern for us, explained they had no copy machine in the building (obviously, I’m not sure there was electricity! ), and told us how much they needed the copies. We danced the dance, both knowing that the universal finale was inevitable – cold, hard, American cash. When the policeman pulled out his phone and started taking pictures of our documents, I knew we were in. He told us that he would drive to San Pedro on his lunch break to print off the photos and a small tip would be appreciated for his effort. I knew I had $30 in one pocket but also knew that there was no way to surreptitiously separate the $10 from the $20, so I pulled out the $30 and asked if that would compensate him for his time. No surprise: it would. He passed us over to the immigration official and explained how he would come with our documents later. I believe this to be true in that everyone else had copies that were attached to the paperwork, but I suspect that no special trip was made and that he simply printed off the documents when he went home for the night. The immigration official was friendly and didn’t raise a fuss. The fee was $320 and I handed him 4 hundreds. 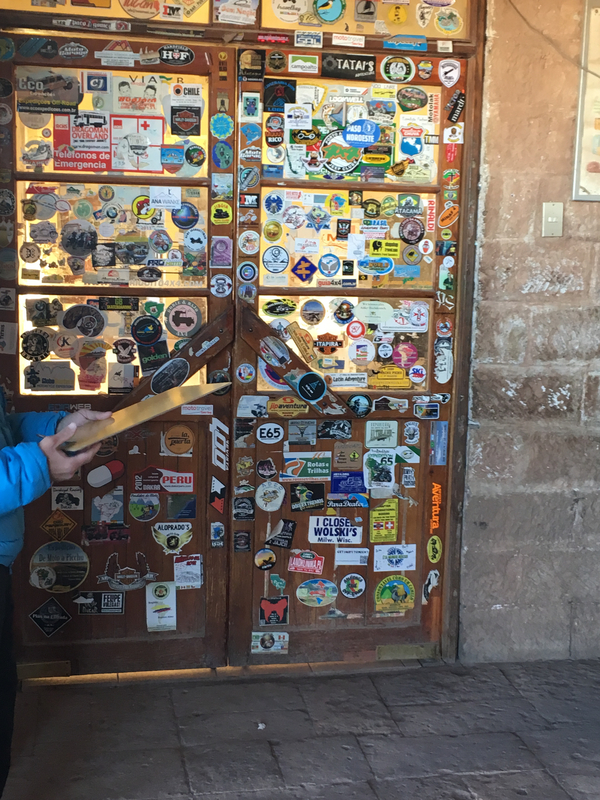 He peeled off 3 twenties and handed them to me one-by-one while complimenting my Spanish, showing me the 10-year visas he gave us and urging us to return many times to Bolivia. I knew, and he knew that I knew, that he was ripping me off but after about a 10 second stare down, I smiled, said thanks and we skedaddled with our visa stamps. We lucked out and had a great group – Beatrice and Jorge from Puerto Rico and Eilidh and Justine from Scotland. While they were all at least 20 years younger than us, we got along well and had good laughs. The fact that Beatrice and Jorge were bilingual was an added bonus as our driver only spoke Spanish and they could translate as needed (although Matt and I understood most of what he told us). We were not traveling in a caravan, but all the SUV tours were going to the same places along the way. We ran into a few groups and they all seemed crabby compared to ours, so we felt fortunate. Although our food was so terrible that a stray dog wouldn’t even eat the cake I offered it. One day I traded my pâté and stale bread for another traveler’s cake. Both parties considered themselves to have received the better end of that bargain. What a great first day! Who knew that sand came in so many colors?! Or that pink flamingoes live at 15,000 feet above sea level on a red lake in a desert? We were delighted at every turn. We settled into our hostel for the night – all 6 to a room! Our companions gave us the “matrimonial” bed – two twins pushed together – but it was so cold in the unheated hostel at over 15,000 feet that Matt and I snuggled into one twin bed to keep warm. Next Up – Rocks, fox and more! 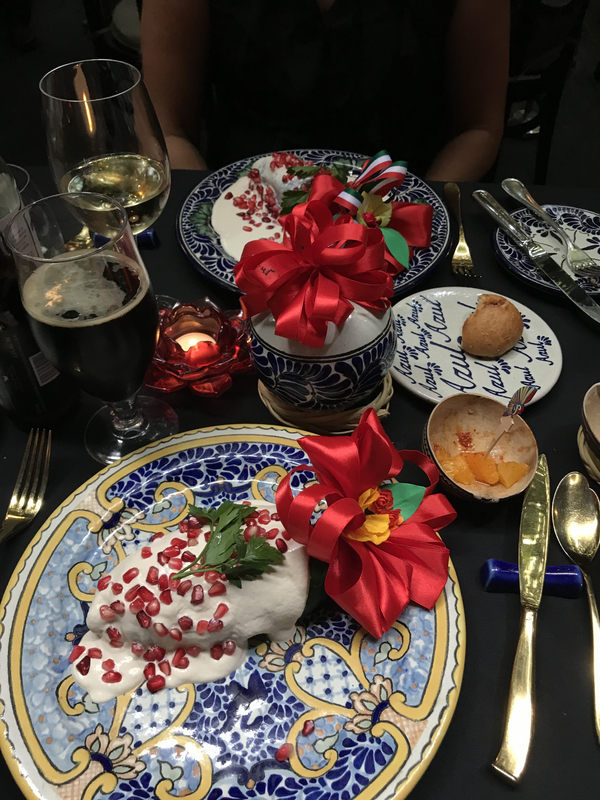 When we arrived to Mexico in August, the restaurants were advertising chiles en nogada, a seasonal dish that also commemorates Mexican Independence. There are variations to the legend of the dish’s origin, but it is generally believed that it was created in Puebla for the military commander Agustin de Iturbide, as he passed through the town on his way to Mexico City after signing the Treaty of Cordoba, which freed Mexico from Spanish rule. The prevailing legend credits the Augustine nuns of the Santa Monica convent with creating the special dish that used local ingredients and incorporated the colors of the Mexican flag. Chiles en nogada require fresh ingredients, and the season runs from August through September although we found that some places continued serving the dish throughout October. The first time I ordered the dish, I had no idea what to expect. The stuffed chile was roasted, battered and fried and covered in a sweet, creamy sauce. The chile was lukewarm and the sauce was cool – was this how the dish was meant to be served or had it sat too long under a heat lamp before being sauced and brought to the table? I wanted to make sure that I was tasting the dish in all of its glory, so we called the waiter over for clarification. He assured us that the dish was served properly and I got down to the business of enjoying every bite. I loved it! It was savory and sweet, crunchy and smooth – each bite was perfect. I resolved to enjoy the dish weekly throughout the season. Once my culinary quest began, I noted that no two chiles en nogada were the same. 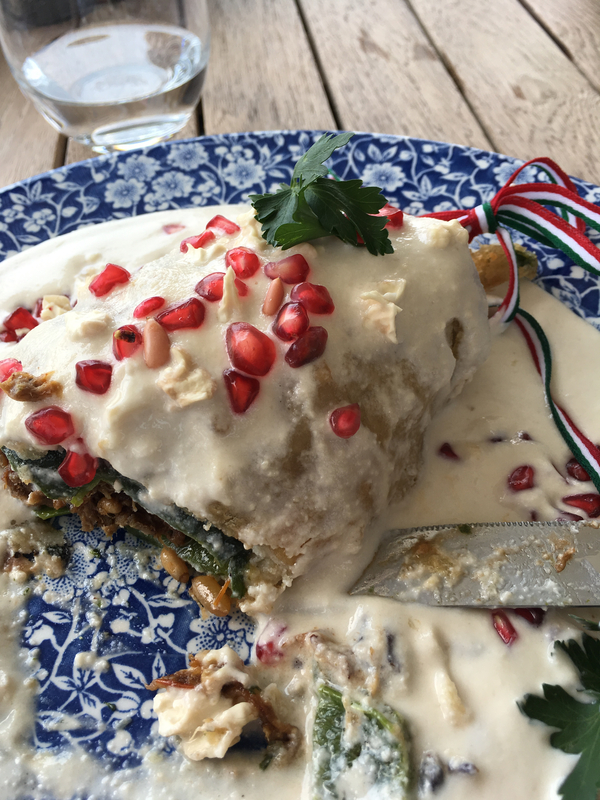 They all started with a roasted poblano pepper stuffed with a meat, fruit and nut filling that was covered in a creamy walnut sauce and festooned with pomegranate seeds. But only my first one was battered and fried, the fillings varied considerably in the meat to fruit ratio and, at one restaurant, you could order sweet or savory sauce or both. I had both, naturally, and decided that the sweet sauce was definitely for me. Similarly, discussions with locals confirmed that every family has its recipe that it swears is the best. One of Matt’s co-workers was delighted that I loved the dish so much and sent home some of his family’s batch for us – delicious! 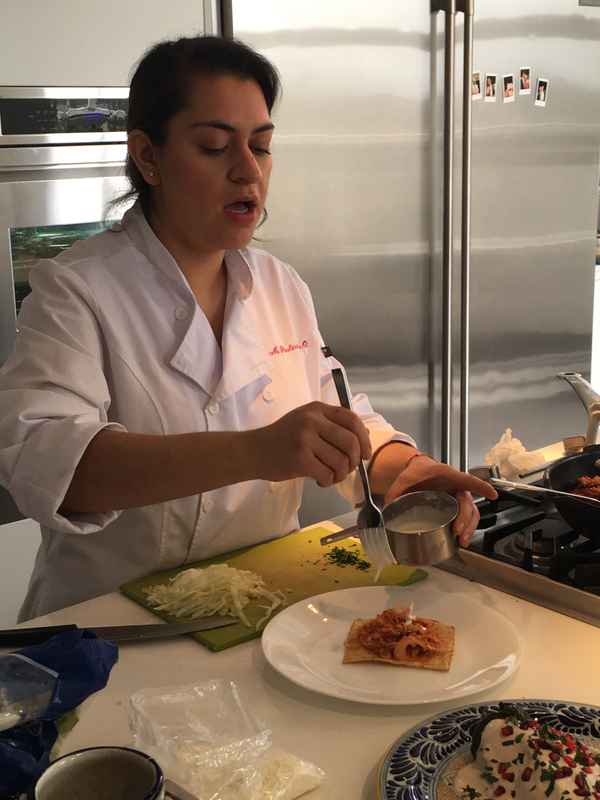 I met Chef Paulina at an event in early September, and when she told me that she was teaching a chiles en nogada cooking class, I was sold. The class was postponed a month due to the earthquake that rocked the city, so I was suffering from chiles en nogada withdrawal by the time the class was rescheduled for late October. 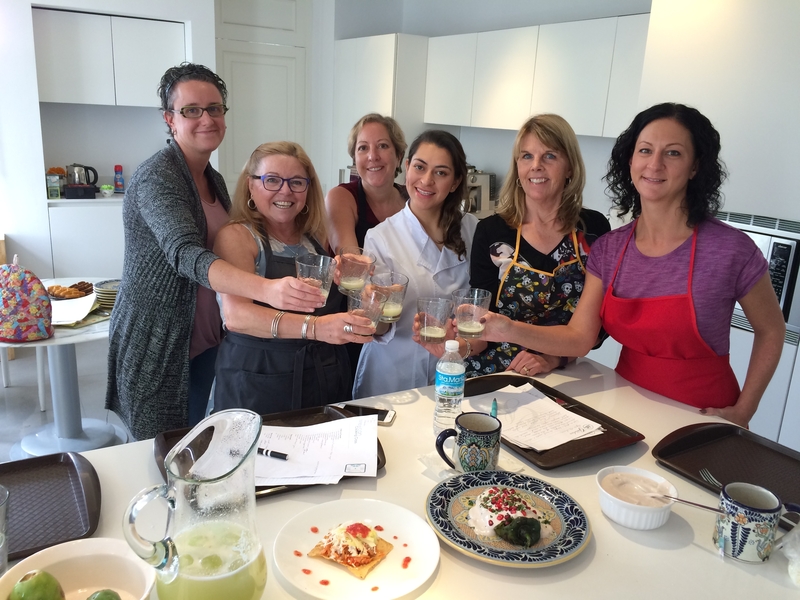 This was my second Mexican cooking class and both started the same way – I showed up at a stranger’s house and was instantly made to feel welcome by the assembled women. The first cooking class was as equally wonderful as Chef Paulina’s class, but it included stiff margaritas, so no blog post about that one! Despite our propensity to chit-chat, Chef Paulina put us to work. In addition to chiles en nogada, we were also making tinga de pollo, agua de tuna and a salsa. First up was a chat about the fresh ingredients and how to peel those pesky walnuts. Not crack, people, peel! Thank god that Chef Paulina had already done that step. She then dropped a chicken breast in a pot of water and added salt, garlic, onion and, later, a cinnamon stick to prepare the chicken and a stock for the tinga. The chiles were placed to roast on the open flame and we peeled, diced and sautéed the ingredients for the filling. With the exception of the acitrón, the candied flesh of the biznaga cactus, the ingredients for chiles en nogada were not exotic, just numerous. Even with her purveyor connections, Chef Paulina made a few substitutions from the written recipe due to the quality of the ingredients this late in the season. The first big test of our skills came when we were each provided a roasted pepper for us to seed, remove the membrane and peel off the charred skin. It became obvious why restaurants merely roast the pepper quickly so it doesn’t char and leave the skins on! We all managed to end up with fairly intact peppers. While we were struggling with our peppers, Chef Paulina casually tossed a few tomatoes, slices of onion, garlic and a serrano chile in a frying pan. We students panicked, looking at our recipes – what was this?! She laughed and told us it was just an easy salsa to use to top the tinga tostadas. While you can prepare a salsa with the same ingredients without roasting them, it gives the salsa more depth if the ingredients are roasted before blending. She also started sautéing the onions, garlic and chipolte for the tinga. Ultimately, Chef Paulina would add a puree of tomatoes, chicken stock, raw onions and the sautéed chipolte to the onions and now-shredded, cooked chicken and allow it to cook down until the liquid was absorbed. The blender got a workout as the sauce for the chiles en nogada was easily made by tossing the ingredients into the blender and processing until smooth (but not too smooth). After a quick lesson on agua de tuna – which has nothing to do with fish as “tuna” in Spanish means prickly pear, or cactus fruit – we were ready for assembly. Chef Paulina explained that the tinga de pollo could be made into a taco or a tostada. If made into a taco, only the chicken tinga would be added to the soft tortilla shell. As a tostada, the tinga was topped with crema (a less-acidic, more liquid sour cream), panela cheese, lettuce and salsa. She laughed at our Tex-Mex ways of overstuffing a taco and explained that it was not done here. As we enjoyed the tostadas, Chef Paulina prepared the chiles en nogada for us to take home to share with our family. It was a great class: Chef Paulina was a patient instructor, everything was delicious and I met some new friends in the process. 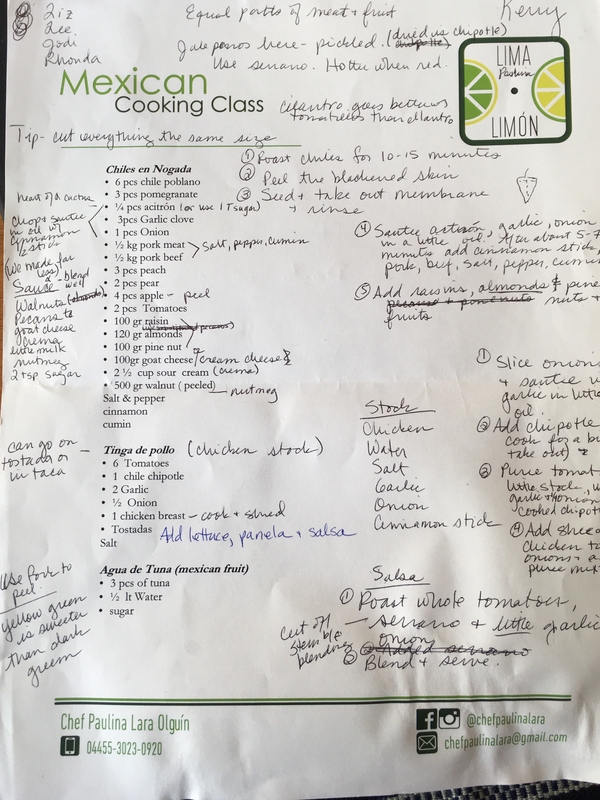 Lest you think only a professional chef can pull off these recipes, a few days after the class, I gave chicken tinga a shot. The dish came together easily. I was pretty excited when I learned that fresh corn tortillas at my local grocery store were $.67 for about 40 of them! Of course, we ultimately gringo-ized our tinga tacos and added panela cheese and lettuce. They turned out great! Maybe next year I will have a chiles en nogada party… or maybe I’ll just keep eating them in restaurants. 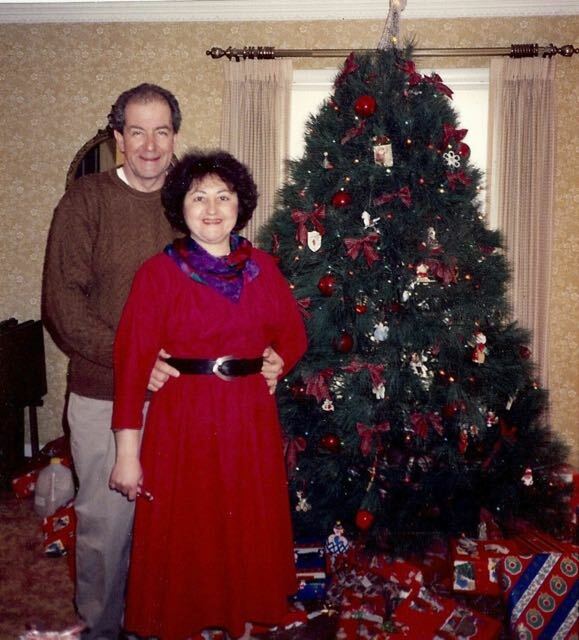 Several years after both of my parents had died, they both appeared in my dream one night. 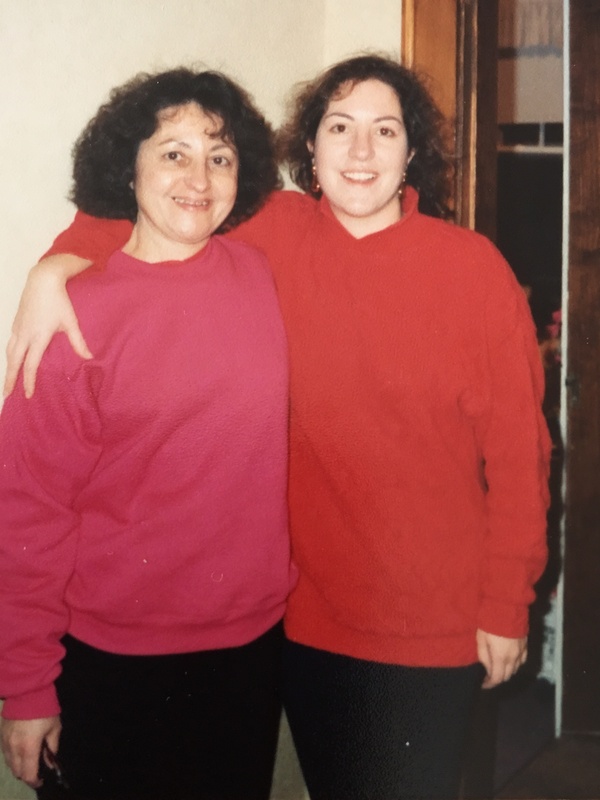 The dream was nothing special: we were milling about doing normal things in my final childhood home. No words of wisdom were spoken or cryptic message divulged. I woke up so happy as though both had visited me after so many years apart. 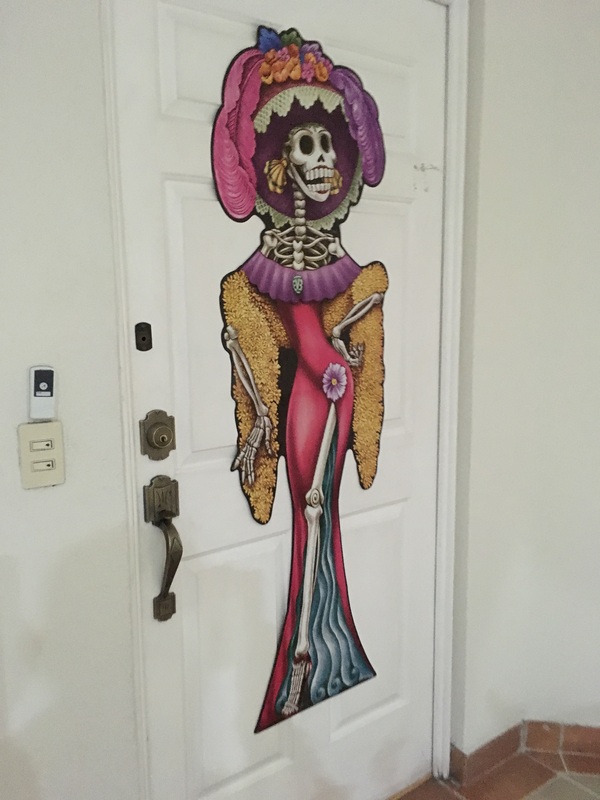 That is Día de Muertos. Día de Muertos (Day of the Dead) is actually celebrated on 2 days in Mexico – November 1 and 2 – and is when the path between life on earth and the afterlife is open. This allows the dearly departed to return to earth to visit their living family. The living entice their dead relatives to visit by setting up altars (ofrendas) in their homes dedicated to their beloved – their pictures, favorite foods, mementos, sugar or candy skulls (calaveras), pan de muerto (sweet bread with a cross of “bones” on the top), candles and flowers. Or you can try to entice the famous – we were told of ofrendas for JFK, Marilyn Monroe and James Dean, among others. Marigolds provide the dead a path back to the living and are everywhere in the days leading up to the holiday. November 1 is the day for departed children and November 2 is for adults. Families will celebrate in their homes or in the cemetery where their loved ones rest. Unlike Halloween in which the dead are feared, Día de Muertos is when the dead are welcomed. And who wouldn’t want to see their deceased loved ones, if only once a year? Matt and I did not make an altar this year as we didn’t fully understand the holiday, but next year we will be inviting our deceased loved ones to pay a visit. A new tradition for Día de Muertos in Mexico City is a fantastic parade. Spawned by the James Bond movie, Spectre, which (apparently) begins with a (staged) Día de Muertos parade in Mexico City, the municipality now sponsors a parade. Matt and I headed into the city early on Saturday to check out the scene and get a good spot. We were rewarded by happening upon the staging area and getting a good look at the floats before the parade began. After wandering around for 3 hours, we secured our spot an hour before the parade and were not disappointed. What an amazing spectacle! It began with a moment of silence and a moving tribute to the earthquake victims and rescuers. The next part of the parade, “The Living Dead,” was a walk through history and began with Mexico’s pre-hispanic roots. Next up were the Spanish Conquistadors and the Widows’ Altar. The colonial period was represented with some great dancing and costumes. A devil chasing an angel provided some comic relief and some interesting, but inexplicable (to me and my Spanish teacher) costumes followed. Revolutionaries put on a show and then the press got a nod. The next part of the parade – Carnival of Skulls – continued the fun. A wonderful introduction to Día de Muertos and a great celebration. We left the Galapagos Islands for the opposite end of the spectrum: Mexico City! A city* of 9 million people, with a metropolitan population of around 22 million, Mexico City is a booming metropolis filled with parks, plazas, museums, shopping malls, world class entertainment and fantastic restaurants. The Mexica people (Aztecs to us) built their capital city of Tenochtitlán in 1325. The city is over 7,000 feet above sea level but was originally built on an island. As a result, it continues to sink at a rate of up to 4 inches per year. Conquered by the Spanish in the 1500s, and renamed Mexico City, it is the oldest capital city in the western hemisphere. After the cultural desert of the Galapagos, we are thrilled to be back in an environment where traditions abound, the climate is temperate and there is more to do than go to the beach. We live in Cuajimalpa, the most western “delegation” or borough of Mexico City. Cuajimalpa is situated in the Sierra de las Cruces mountains at an elevation of 8,900 feet. It was a separate rural town until being engulfed by Mexico City’s urban sprawl. As a result, it has a local feel, similar to our home in Cajamarca, Peru, but minus the farm animals. We are not in a fashionable ex-pat district of the city, although there are both McDonalds and Starbucks within a couple of blocks of our house (not that those make it fashionable, just typical). While it takes us about 45 minutes to get into the city, Matt has 3-minute, door-to-door walking commute that can’t be beat in a place where 1 1/2 to 2 hour commutes are not uncommon. A large, Walmart-owned supermarket is around the corner, but the neighborhood also has a Saturday open air market, which are called tianguis here, and there is a permanent market about a mile from our house. There are countless shopping malls throughout the area, with a few nice ones 15-20 minute car rides from our house. With some very minor exceptions (decaf black tea, parchment paper, Shout colorfast sheets), we can find pretty much everything we want or need in the city. What a difference that has been compared to our last two moves! We learned from our other moves that it is best to get settled in quickly by buying what we need to make our home comfortable. We spent our first two weeks here going to the mall or some big box store almost every day. It wasn’t that we had more than a car-load of things to purchase, but when you don’t own a car, you can only buy what you can carry. One day, in a Home Depot, Matt looked at me and said, “Are we in Wauwatosa or Mexico City?” Apart from the language, it is hard to tell when you are in American stores that look exactly the same. We were lucky to have our shipment from the U.S delivered 2 1/2 weeks after we arrived – it felt like Christmas! We didn’t waste any time and had a chair reupholstered, paintings framed, our apartment painted and our artwork hung. We are having a media console and end table built and have a few more odds and ends on the wish list, but it feels like home. Inexpensive, fresh flowers are a big plus! Matt is thrilled to have a recliner again! It hasn’t been all work since we arrived. I joined a book club and knew it would be a good fit when 50% of their titles matched the titles my Milwaukee book club has read. I’ve met nice people through the club and the International Women’s Club. While the drive time from the city makes it rare that we go there on a week night, we head to the city most weekends. Depending on who is counting, Mexico City has more museums than any other city in the world, so we have plenty to choose from. In addition to visiting several permanent collections, we have seen a Pablo Picasso – Diego Rivera exhibit and an Andy Warhol one, complete with a reproduction of the Factory’s balloon room. Mexico City is famous for a movement to bring art to the people via enormous murals so those pop up in plenty of places too. But my best museum visit thus far was when our friends, Beth and Chris, were visiting last week because we were going to the U2 show and we ran into Bono at the Soumaya Museum! He was incredibly gracious with his fans and I even shook his hand. What a great brush with fame! The man, the legend, Bono! While I know that we are in the honeymoon phase with Mexico City, so far all signs point to it being a lasting love affair! * Mexico can refer to three political units. First, the country, officially the United States of Mexico. Next, the State of Mexico, which is one of 31 states in the union. Finally, Mexico City, or the District Federal (D.F. ), which is separate from the State of Mexico and its own federal political unit, like Washington, D.C. in the U.S. 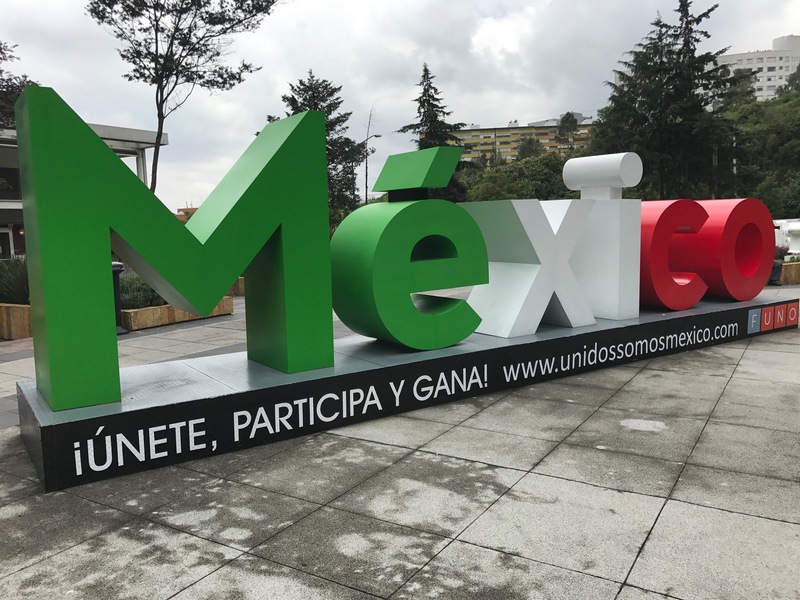 While in 2016 the city’s name was changed from Mexico Distrito Federal of Mexico to Cuidad de Mexico (Mexico City, CDMX), many people still refer to the city as D.F. When I 15, I went to Niagara Falls and was underwhelmed. I don’t know what I was expecting, but I recall thinking the gardens were pretty and feeling cheated by the falls. I was expecting something majestic and it looked like a big dam. Decades later, Iguazú Falls provided the majesty I was seeking. Iguazú Falls is on the border between Argentina and Brazil and is described as the “largest waterfall system in the world,” which I learned is because there are various ways to measure waterfalls in order to maintain bragging rights! We wanted to go to both sides of the falls but didn’t have time to get the required Brazilian visa. While I read posts that said sneaking visa-less over the border in a cab was no big deal, we decided not to become an international incident and stayed in Argentina. Compared with many of our adventures, it was pretty easy to get to the falls – we walked into town from our lovely hotel, the Iguazú Jungle Lodge, and caught a bus to the falls. Once there, it reminded us of the Milwaukee County Zoo – walking paths winding through wooded areas, kiosks and concession stands and even a train to take you to the “Devil’s Throat” to see where about 1/2 of the Iguazú river’s volume crashes over the top of the falls. The Devil’s Throat is 80 meters (262 feet) high and 2,700 meters (8,858 feet, 1-3/4 miles!) in diameter. The entry to the falls had an amusement park feel, but soon we were taken by the natural beauty. I had so much fun the first day and we didn’t get to see every corner of the park, so I decided to return the following day. Matt opted to join me and was glad he did as our first day was overcast and the second day sunny, which gave different perspectives. Plus, it had rained considerably overnight so the falls were noticeably fuller the second day. Don’t Say They Didn’t Warn You! First stop both days was the Devil’s Throat. Spectacular! Thank goodness that I had to get over my grate phobia in El Calafate, because I really had to get over it to enjoy Iguazú Falls! On the first day, we had bought tickets for a boat ride under the falls. We lingered at the Devil’s Throat and then needed to scurry around the park to find the boat launch. Somehow we missed a turn and arrived 5 minutes before the boat was leaving. Thankfully, we were obviously not the first clueless tourists and the worker provided us tickets for the following excursion. I had been ambivalent about doing the ride, but it was great fun. You cruise down the river and look at the falls and then suddenly the captain guns the engines and drives you smack into one. Despite the ponchos, there is no escaping the deluge of water. I thought the women who brought swimming goggles were brilliant as I feared my contacts were going to get pushed out of my eyes! When you are on the trip, you feel like you are directly under the falls with the amount of water that crashes down on you, so I was surprised when we watched another boat cruise into the falls and saw that they really just go to the perimeter. I loved that there were so many waterfalls to see – between 150 and 300 depending on the amount of water flow. Each one was pretty in its own way. If Only I Remembered Which Was Which! The lush jungle setting made it so much more magical than Niagara and allowed us to see capuchin monkeys, toucans and other birds, coati (raccoon-like creatures that will shamelessly try to steal your food) and butterflies. There were boa constrictor warning signs and jaguars in the park, so I watched for those although I couldn’t decide whether I was disappointed or relieved when we didn’t see any!